At their core, every MMOG is about community. 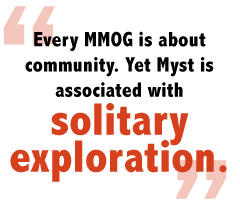 Yet Myst is associated with solitary exploration. Cyan went to great lengths to instill in the player a sense of isolation. How could that possibly translate into a massively-multiplayer experience? When Cyan dropped the project in 2004 due to financial woes, the game stayed alive through unofficial "shard" servers. The community remained in the cavern, creating their own stories. Only recently has Cyan returned to support its players, but the players never lost their resolve. Why? What makes Uru special? Roleplaying in other online games rarely extends beyond greeting people with "Hail." The "roleplaying" aspects of the game are essentially level-grinding and stat-manipulation. The depth of someone's character exists only in his loot's cool factor. Without that loot, the game's appeal disappears in an instant. Uru's appeal comes not from leveling and growing stronger but from exploration and taking part in the game's evolving storyline. To say Uru has reached a point where players are actually involved in the story would be stretching, but the building blocks are in place, and the potential is staggering. As it stands, the storyline, generally revolving around strange "Bahro" creatures who have suddenly appeared en masse in the cavern, plays out in real-time, with "actors" at Cyan playing important characters that interact with explorers: giving speeches, answering questions, even making jokes. The game hasn't yet reached its full potential. The DRC has plans to eventually reinstate the D'ni Guild system. These guilds are not like other MMOG guilds; each guild has a specialized purpose, and its members have special duties. The Guild of Greeters will help new explorers get their footing, the Guild of Messengers will be the heart of in-cavern communications and the Guild of Writers will be tasked with "writing" new Ages - that is, level creation. Already, the community is forming charters, ranking systems, web resources and content creation tools that will eventually coalesce with official guild support into something that gives the player unprecedented power in the world. But perhaps the greatest example of the player base's creativity is on the individual level. Some explorers have taken it upon themselves to create avatars that blur the line between player and "official" character, with fascinating results. Take Echo McKenzie, the "seer," known to have visions of the past strike her. As she walked through Kirel, the guild neighborhood, she spoke in great detail of the birthday party of one of the oldest living D'ni women that had taken place in that very spot hundreds of years earlier. Her vivid descriptions entranced the crowd of followers, most of whom were unsure if they were listening to canonic material or a bored player. Uru has led a quiet storytelling revolution in online gaming. No longer will stories be conveyed through scripted NPCs and paragraph-long books on shelves but instead through living characters, rich interaction and the work of a community that contributes as well as consumes. As Atrus once said in Myst's introduction: "The ending has not yet been written."